We can alleviate your purchasing stress. 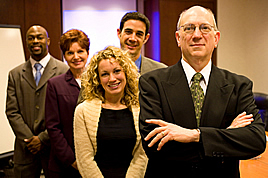 Your account team is seasoned with years of experience. A dedicated account manager, equipped with the best training our industry offers, will be assigned to your account. A team of devoted customer service representatives is also available to handle all your account-related questions. Our service technicians and machine specialists repair equipment and perform demonstrations either in-house or on-site. We also provide E-commerce solutions and reporting customized for your business. With a reputation that spans more than eight decades, we understand how important it is to make sure all our employees are handpicked and well-trained. In today's business climate, it takes a team like this to win. Let Empire Paper be your choice for MVE (most valued employee).